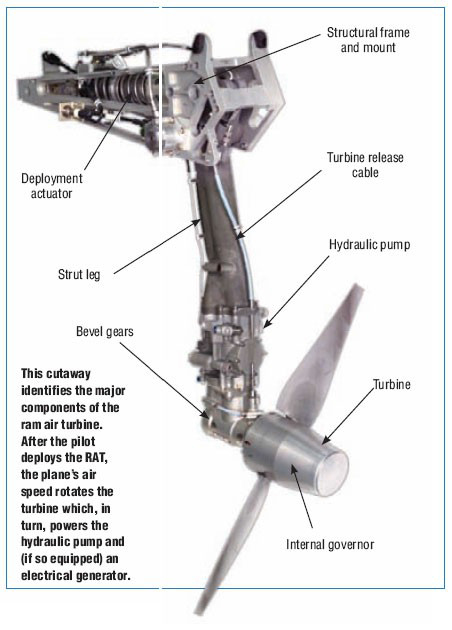 When RAT is deployed into the airstream, the turbine on the RAT starts to windmill and drives an emergency alternator to generate power. The modern large commercial airplanes like A380, use multi-bladed ram air turbines, capable of producing between 25 and 70 kW of peak power. The RAT is mounted on a shaft that provides swivel couplings for the pump supply line and pressure pipelines.